It is well known that it is difficult for doctors to remain always current on often changing guidelines, (particularly those doctors who treat fewer cases), but to also be able to apply these best practice guidelines consistently in every case, in every emergency. The medical research confirms that best practices and the latest standards of care are not followed consistently for many conditions in alarmingly high instances. There has been reputable research done that now states medical error is the third leading cause of death in the United States.2 There are countless deaths each year that could be prevented by medical staff having the best practice available to them immediately. The most important factor in stroke treatment is time. Proper treatment in the shortest time frame is essential to have the best possible recovery. And someone may suffer a stroke while being unreasonably far from a proper stroke treatment center; some remote medical centers take advantage of expensive telemedicine services to contact an expert doctor in another location, relying on his or her availability and opinion. Using the telehealth system would require the medical staff to constantly contact the doctor for updated information and new recommendations; what happens when the patient moves to acute care and the hospital decides the telehealth system is too expensive to use outside of emergency care? Newer options are developing in the care of stroke (and other conditions) that can assure physicians are following the very latest standards of care for every patient, every shift. Real-time, web-based decision support tools can provide such expert advice, backed up by evidence and research, at any time, and at the patient’s bedside (much less costly than most telemedicine systems). Advances in stroke treatments over the past decade have greatly improved survival rates, but there is still room for more improvement and achieving higher levels of compliance with the latest standards of care is one of the best pathways to better outcomes and reduced cost of care. As Dr. Foff states, well researched guidelines exist for almost all aspects of acute stroke care that should guide clinicians. Interactive tools that consolidate these best practice guidelines for physicians and nurses in a fast, simple, and straightforward manner help clinicians better serve their patients with higher compliance to what are considered the latest standards of care. Higher compliance has been shown repeatedly to not just improve patient outcomes but also potentially prevent permanent disability from a stroke. Decision-support tools like this also provide hospitals with high levels of quality assessment and quality assurance, providing a consistency of care across cases while helping them to track and analyze their own guideline compliance for continuous performance improvement. Qmetis has developed its own web-based, interactive decision-support tool for stroke care for hospitals, doctors and nurses, Stroke Comply, its third such product in the Comply Suite. The best practice treatment guidelines presented to a clinician responding to a stroke patient through Qmetis’s program will help reduce the risk of another event in the future, as well as determine risk factors that may be modifiable. With the guidelines in a concise and clear format through Qmetis’s decision-support tool, medical professionals can be better equipped to easily and quickly provide the best treatment. Foff, Erin Pennock. 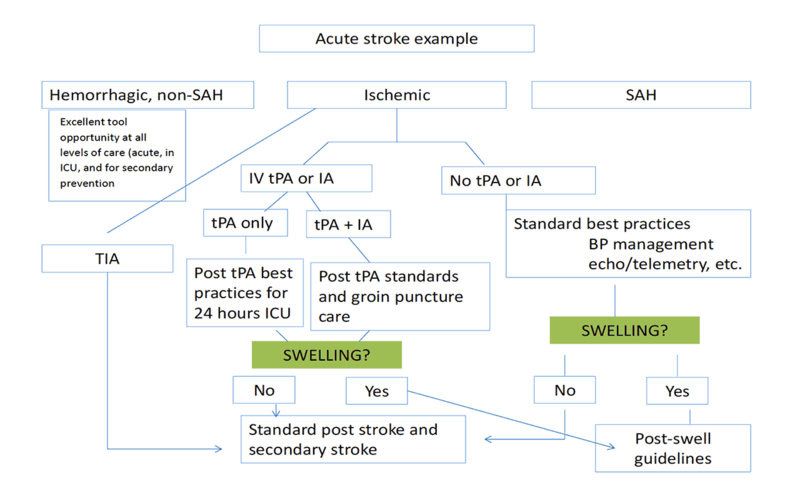 “Feasibility of Algorithmic Approach to Best Practices in Stroke Management.” Jan 21 2016. Makary, Martin A, and Michael Daniel. “Medical Error—the Third Leading Cause of Death in the US.” BMJ, Mar. 2016, doi:10.1136/bmj.i2139.